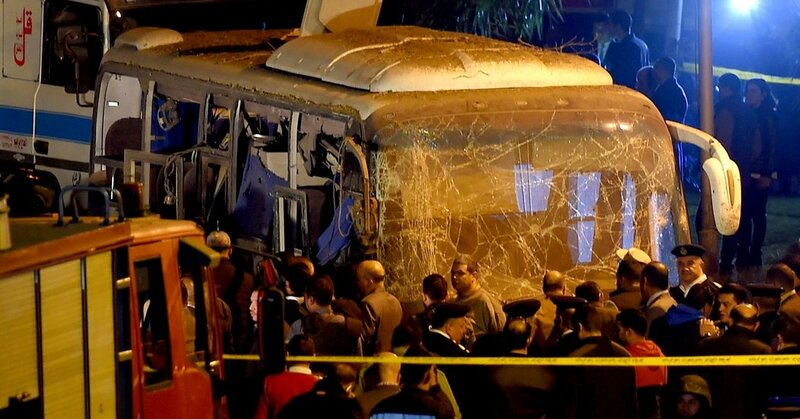 CAIRO – A bus full of Vietnamese tourists was shaken by a roadside bomb near the famous Giza Pyramids on Friday. At least three people were killed and eleven were wounded. The primitive explosive had been stashed near a wall In the Mariotiyah area near the pyramids, the Home Office said. The dead included two Vietnamese tourists and an Egyptian tour guide. Prime Minister Mostafa Madbouly told reporters that the bus left the specified route without any notification from the authorities. Pictures of the crime scene showed a small, soot-covered, white bus whose windows were shattered and blown out. No militant group immediately took responsibility for the attack, but since 2013, Egypt has been fighting against a subsidiary of the Islamic State in Sinai. The Sinai uprising targeted mainly security forces on the peninsula and a Christian minority on the mainland in separate attacks. However, the militant group also took responsibility for firing a Russian aircraft in Sinai in October 2015, killing all 224 on board. Last month, armed men opened two buses some 85 miles south of Cairo, killing seven Coptic pilgrims. In November 2017, the militants counted during prayer on another minority, Muslim Sufis, killing at least 311 people, the deadliest sectarian bloodshed in modern Egyptian history. The security forces have tightened the security of Christian places of worship in anticipation of attacks against the Egyptian Coptic minority during New Year's Eve celebrations and the Coptic Orthodox Church's Christmas celebration next month. The attack is just as Egypt's tourism has shown some signs of recovery after years of political unrest and violence The uprising of 2011 triggered Hosni Mubarak, who had ruled the country for almost 30 years.